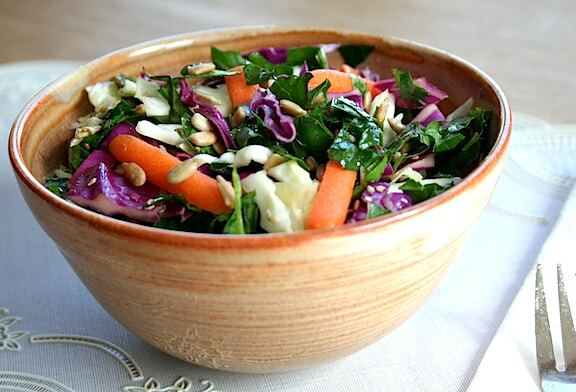 This colorful and crunchy slaw combines massaged kale with both green and red cabbage. It goes with just about every kind of meal, and you can vary it each time with different dressings (see suggestions following the recipe). You can also add a little dried fruit or apple for a sweet twist, as suggested in the variation. Photos by Rachael Braun. 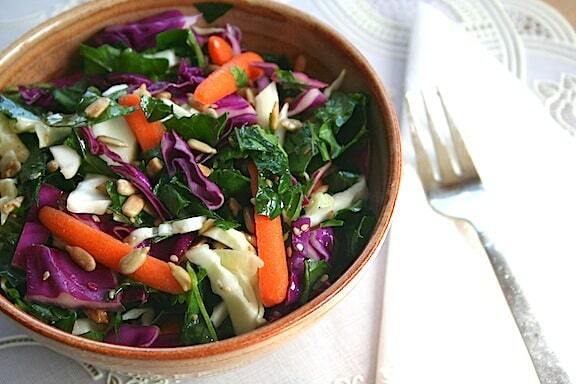 This colorful and crunchy slaw combines massaged kale with both green and red cabbage. It goes with just about every kind of meal, and you can vary it each time. Strip the kale leaves off the stems. If you'd like, you can slice the stems super-thin, otherwise discard. Slice the kale leaves thinly. Rub a small amount of olive oil in your palms and massage the kale leaves for 30 to 45 seconds, or until softened and bright green. Combine the massaged kale (and the stems, if using) and the the ingredients except the last two in a serving container. Stir together, then season with salt and pepper. Scatter the seeds over the top and serve. Note: I especially like this with sesame-ginger or tahini dressing, but a simple vinaigrette works as well. Use the easy recipes here on VegKitchen, or the natural, store-bought versions of them. Variation: Give this salad a slightly sweet twist by adding 1/2 cup raisins or dried cranberries, or a thinly sliced apple.